So Germany probably avoided a recession last year, although further data publications might yet change that conclusion. What is clear though is that the economy hit a weak patch in the second half of last year. It’s not alone. The eurozone as whole slowed markedly in the third quarter of the year. Two large economies, Germany and Italy, contracted in that period, though Spain and France both managed reasonably firm growth. Germany, as a leading exporter, is especially exposed to the global trade climate. A slowdown in international commerce is a major part of Germany’s loss of momentum and China is an important element in that story. It’s Germany’s third largest export market. A recent survey of German manufacturers found the steepest fall in export orders for six years and a number of firms reporting lower sales to China. Germany’s export orientation also makes it vulnerable to the tensions in global trade spilling out from the United States – the new tariffs on steel and aluminium and the conflict with China. For Germany, and the eurozone more widely, there are certainly clouds on the horizon. Germany may have dodged a recession, but a period of slower expansion looks likely. It’s worth adding that whatever other problems Germany might encounter, unemployment is currently very low. 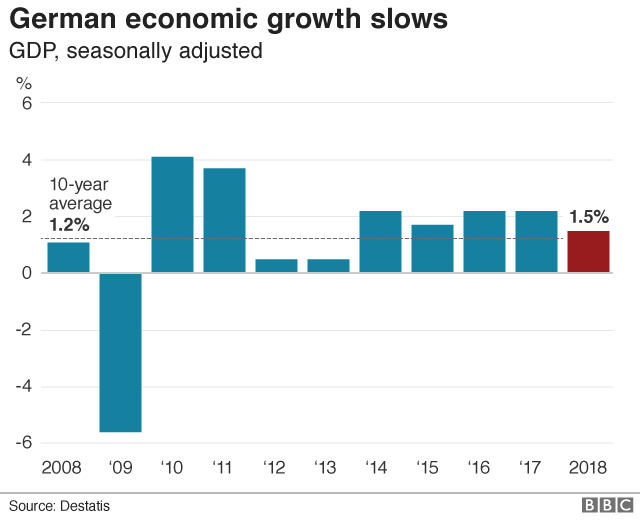 Claus Vistesen, chief eurozone economist at Pantheon Macroeconomics, said the best guess was that the German economy had avoided recession, but the main story was still that the economy had lost pace, “thanks mainly to a slowdown in consumers’ spending and exports”.